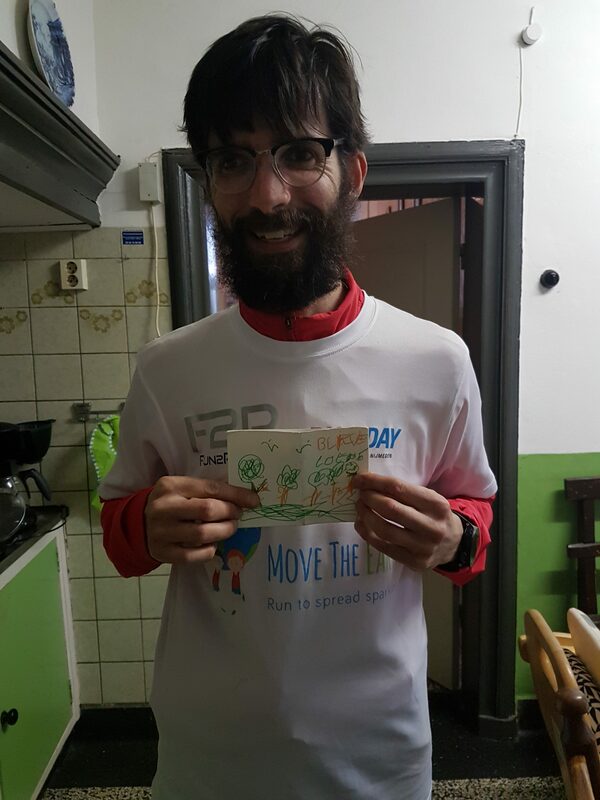 With Move The Earth we run in 125 marathons from The North Cape to Palermo to spread the power of positivity. For the people that are having a hard time. With acts of joy we give them the bright spots they so desperately need, with the question: which act can we do that makes you or someone else happy? This way we create one big ray of light together. Do you want to join this adventure by running, doing massages or driving a camper van? Or do you want to help in a different way? Mail to info@movetheearth.run or fill in our wish list. 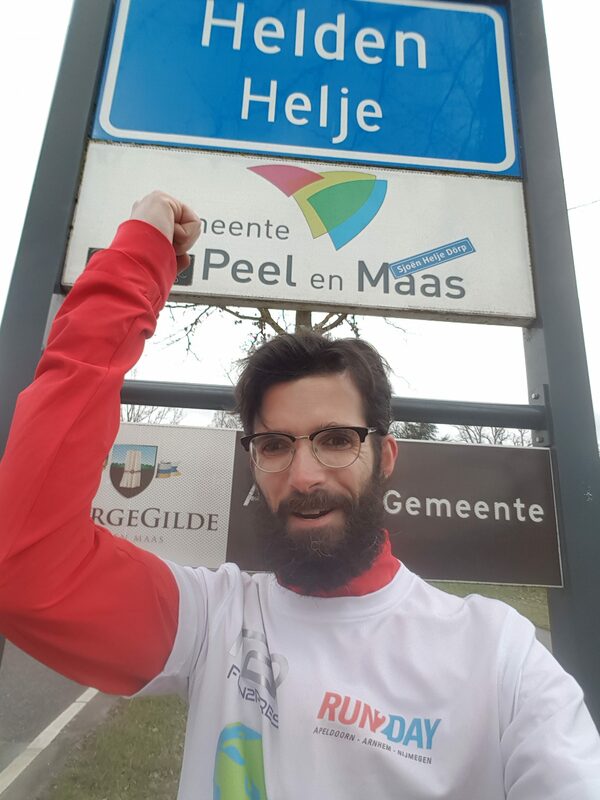 From the 1st to the 6th of april I ran 6 marathons through Limburg. A retrospective on a marathon a day. Day 3: Kronenberg – Horn. Janne’s dad helps me pick the right energy bars. On my way to Horn. Immediately surrounded by forests. This never gets old. After that long moments of stillness. At Helden I think of all the heroes that helped me along the way. And that we can be heroes. Everyday. Via Helden Forest I end up in Kessel. From Kessel to Neer I see the many faces of the Maas. Babbling creek, small waterfalls, endless viewpoints. To wind up in the many bridges and small winding roads along the creeks of Haelen and Leudal. I ask two passers-by to do a crazy dance. I catch a smile, for the dance I continue my search. Just before Horn I find a woman that wants to do some weird moves in front of the camera. Act of joy succeeded. As icing on the cake – and because I like it way too much to a act crazy – I make another film with my own funny moves and silly walks. In Horn I get a warm welcome. The woman thinks I’m a little bit crazy. Maybe I am. The day blows through my head, and I slowly get into a flow. The next marathon I share with my dad. He will run along with me to Urmond. For me this is already a moment of happiness. Day 2: Arcen – Kronenberg. Tim and Ilse wave goodbye. Well rested I run into the second marathonday. The flower arch of Lottum welcomes me. Endless roads, nice forests, and a lot of difficult kilometers. It’s hard. Horst is the first tone in the music journey within the adventure: Rowwen Hèze. The accordion wobbles through my mind. I leave behind the tough kilometers. In America I carry ‘Blieve Loepe’ with me. Keep running. My imagination takes a swing at me on the Zwarte Plak and Helenaveen. The songs sing their tune. At Helanaveen the path ends. A fence and barbed wire. Preserved area. Luckily there are more paths to a destination. While I continue, I grab my markers and paper. While running I draw myself, along the border of Helenaveen. I meet lots of chapels, but I cannot reach out to one of them. “Out of fear of destruction?”, I wonder. In my mind I light a candle for my muse. In Kronenberg Janne is cooking. I give her my beautiful moment. Drawn with speed, and with Helenaveen in my head. After a shower I join dinnner, and shake hands with her lovely father. We share small stories. And a little jar with coloured pencils in the shape of a key chain. The day is saved, and with a nice feeling I dream into day 3. Day 1: Gennep – Arcen. On the road with a little, but carefully equipped backpack. In the woods of Heijen I tell the storytellers of Gennep News about the journey through Limburg and my running adventure of happiness. Slowly I disappear in the forest, taking the first steps into freedom. After 5 kilometers I fiddle with one the zippers of my backpack. Broken. No safety pins, so I decided to stuff the free space up with my jacket and thermoshirt. Let’s see if this works. Will fix it in Arcen. In the meantime I see the first beautiful trees through the forest. Each in its own way. 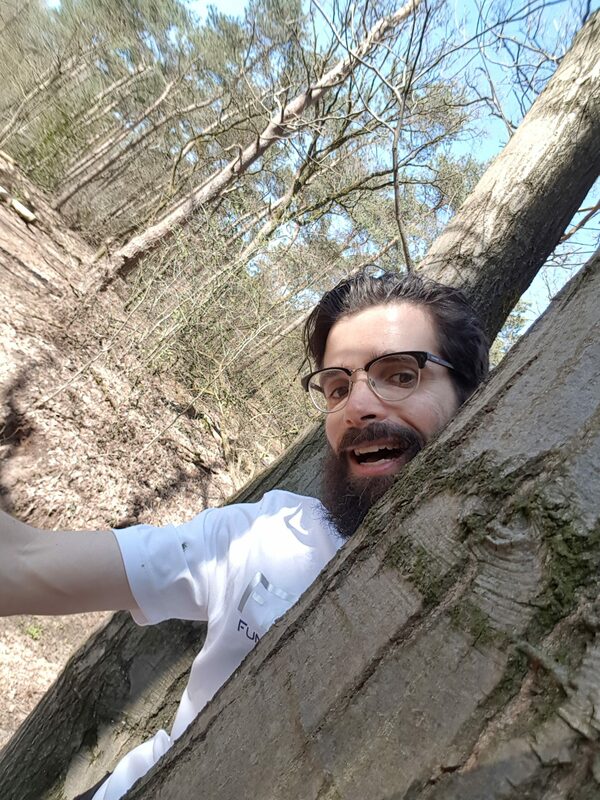 The first trees are captured by the camera with a hug and a smile, for the act of joy of today. On the way beautiful surroundings. Already. With navigation skills of a chaotic dreamer I help a woman to Reinders Lake. Miraculously we both reach the lake. We wave at each other. I smile, and I already think about the big trip through Europe. The unexpected is beautiful. Via the lake I run into the Hamert. Totally amazed. Images fly through my head. The most beautiful ones also fly through the camera. I keep going. For a moment I stand still at the most beautiful tree of the day, and take in the energy. In Arcen Ilse and Tim are waiting for me. They bring me to a colourful group of dogs, cats and horses. And parcheesi. Safety pins rescue my backpack. I am ready for tomorrow. The 6 marathons have started. Gennep News asks me about my plans, my dreams. Then I continue my run to travel to Arcen. On to the Vaalserberg! Follow the steps of our joyful running adventure.